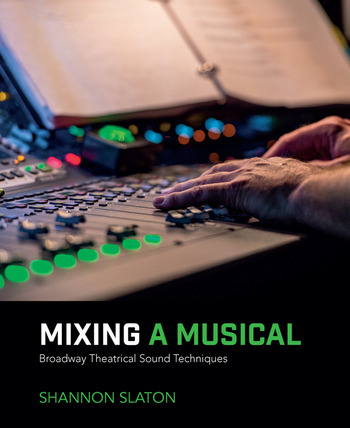 Mixing a Musical: Broadway Theatrical Sound Techniques, Second Edition pulls the curtain back on one of the least understood careers in live theatre: the role and responsibilities of the sound technician. This comprehensive book encompasses every position from shop crew labor to assistant designer to sound board operator and everything in between. Written in a clear and easy to read style, and illustrated with real-world examples of personal experience and professional interviews, Slaton shows you how to mix live theatre shows from the basics of equipment and set ups, using sound levels to creating atmosphere, emotion and tension to ensure a first rate performance every time. This new edition gives special attention to mixing techniques and practices. And, special features of the book include interviews with some of today’s most successful mixers and designers. Shannon Slaton is a sound designer based in New York. He has designed the tours Elf, Kiss Me Kate, Noise/Funk, The Full Monty, Contact, Tap Dogs, Hairspray, The Producers, Sweeney Todd, The Wizard of Oz, The Drowsy Chaperone, Sound of Music, Bullets over Broadway, and The Wedding Singer. His Broadway work mixing includes Man of La Mancha, Bombay Dreams, A Christmas Carol, Sweet Charity, Jersey Boys, Dirty Rotten Scoundrels, The Drowsy Chaperone, Spring Awakening, Fela!, Anything Goes, Holiday Inn, Annie, Cabaret, Springsteen on Broadway, and Legally Blonde. Off-Broadway he assisted on Hurly Burly and on Broadway he assisted on Steel Magnolias and was the Associate on Barefoot in the Park, Blackbird, An Act of God, Present Laughter, Meteor Shower, and was the Production Sound on Wicked. Regional designs include shows at George Street Playhouse, Casa Manana, and NCT.